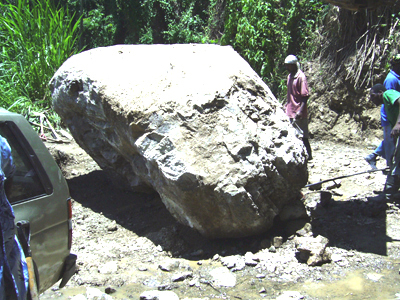 A workman cranks a jack under a huge boulder on the Mount Charles road, in St. Thomas. Caption: As the cases of domestic disputes rise, this boulder was thrown by a woman on her common law husband, who she accused of cheating. Workmen try to rescue the man. Caption: The impact of the asteroid that landed in a section of Mount Charles would have been greater had it not been for the cushioning effect of the domino players it buried. Caption: I am a rock and solid. Move me if you can. Caption: After hearing that boulders in the blue mountains might contain gold, a man tries to load one into his suv to take home. Caption: Yow dan, Watch it!! Me lif up bigga dan dis aready !!! Caption: MAN WITH JACK: \"COME ON GUYS, LET\'S WORK TOGETHER, LET\'S PUT THIS ROCK IN THAT CAR,1,2,3 READY\"
Caption: Anyhow dem fling no more stone afta me dem na go like it! Thank you for the 54 responses we received. Enter again and we hope you will be the outright winner next time.